Touchdown at LAX and in less than 30 minutes you will be settling into the very heart of Beverly Hills. Conveniently placed for a jaunt around LA’s Golden Triangle, the fabled Rodeo Drive is also on hand for a much needed dose of retail therapy. Plush cream carpets, billowing silk curtains and four poster beds; the Beverly Hills Hotel has rooms perfect for padding around in. You have the choice of staying either in one of the super luxe bedrooms or opt for a spacious suite with an alfresco patio or balcony offering stunning views across the LA landscape. Follow one of the winding paths within the hotel grounds and you’ll discover the hotel’s pink bungalows, tucked out of sight in the lush gardens. If you’re looking for ultimate privacy and a touch of Hollywood decadence then the bungalows are where to rest your head. 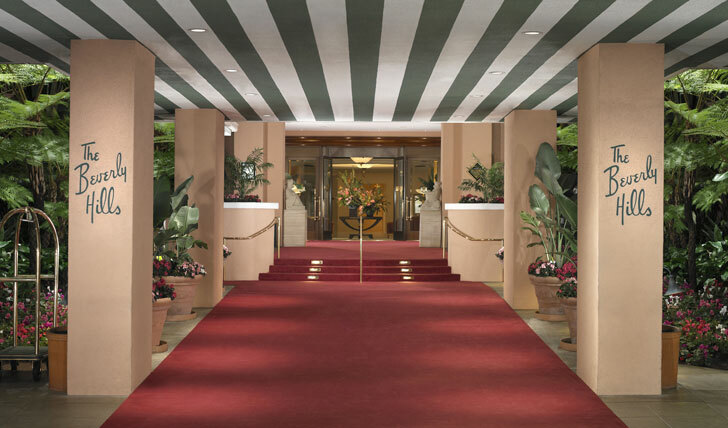 Imbued with Hollywood glamor, the hotel has become part of the Beverly Hills landscape and is so suffused by the history of Hollywood that it has become a veritable attraction in its own right. 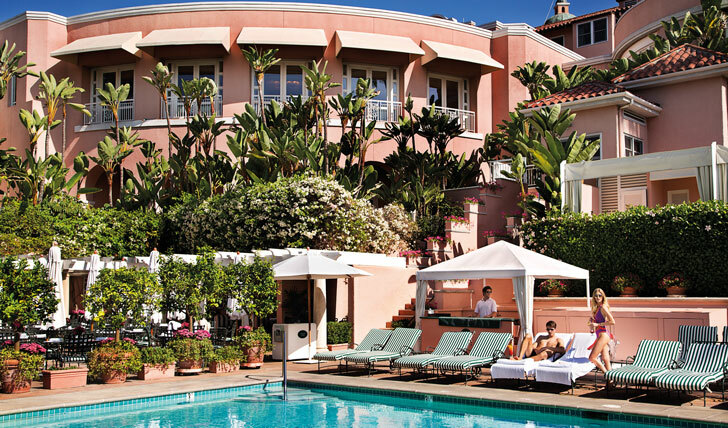 We love the classic 1950’s style that whisks you back to the Golden Age of Hollywood’s hills. To recoup after the transatlantic flight head to the hotel’s pool where you’ll be offered cooling towels, pastel-shade sorbets and, of course, a cleaning service for your sunglasses. The Fountain Coffee Room, with its sweeping counter, funky banana leaf wallpaper and famous soda fountain creates a charming Happy Days feeling, and offers an array of 1950’s delicacies including coke floats, shakes and gourmet coffees. Once the sun has set order a cocktail at Bar Nineteen12, named in honour of the year the hotel opened its doors. With live music as your soundtrack and Beverly Hills as your backdrop, this is as Hollywood as it gets.